It is one of the saddest things in sport to watch some of the greatest players/teams fall of their pedestal. It happened to Liverpool FC through the late 90s and early 2000s. It has happened to the Australian Cricket team recently. It happened to Michael Schumacher on his return and it is happening to the greatest tennis players of all time – Roger Federer. An icon of the Open Era of Tennis, Roger Federer. The man has won the most number of Grand Slams in the history of tennis (17 and still counting). He has the record of being the No. 1 tennis player for the longest duration. The records that this man has created on his amazing journey through speak volumes. Holding the world No.1 position for the longest time – 302 weeks. Which includes a staggering 237 consecutive weeks stretch at the top. His fans across the globe are the most religious lot. Over the years it has not only been his tennis, but also his charm, generosity and attitude that has won people over. If you are looking for an equivalent of Sachin Tendulkar in Tennis, then Roger Federer is your man. And that is why his defeat to Tommy Robredo is one of the hardest things to swallow for Federer fans. Roger has probably had one of the hardest years in his playing career in 2013. Not making a single final in any of the grand slams is not something that happens with a champion like him. Moreover, he has managed to win only one tournament the whole year and has reached a ranking of No.7 in the world dropping out of the top 4, the lowest since 2002. The nature of his defeat and continued lack of form has prompted many to begin discussing his retirement plans. Such is the predicament of geniuses; every move they make is applauded, analyzed, and ridiculed. Statements like ‘He is getting too old for this level’, and ‘he will never win a grand slam again’ start to surface. 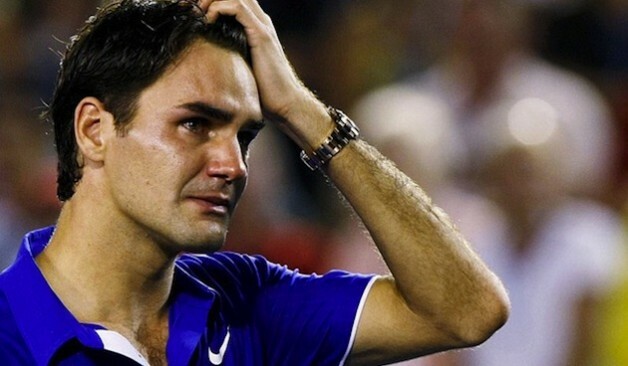 What everybody forgets is how Roger Federer is feeling at the moment. Fans have a tendency to overreact in these situations, as they are the ones getting ridiculed by Rafa and Nole fans at the moment. So they call for Federer to quit playing altogether and rob the world of his immaculate genius. Mark my words – The world will be a lesser place the day Roger Federer decided to hang up his boots and retire to the beautiful country of Switzerland. Tennis world will never be the same without the omnipresent Federer who has given each and every fan across the globe something cheer about (Yes even Rafa fans). The mere presence of Roger Federer is what makes all the difference. The mere presence of Roger Federer is what keeps things sane. PS – I am a fan of Rafael Nadal, and was eagerly looking forward to their anticipated encounter in the quarter final of this year US Open. This entry was posted in Celebrity, Sports and tagged Andre Agassi, Grand Slam, Novak Djokovic, Pete Sampras, Rafael Nadal, Roger Federer, Tommy Robredo, US Open on September 4, 2013 by missionsharingknowledge.